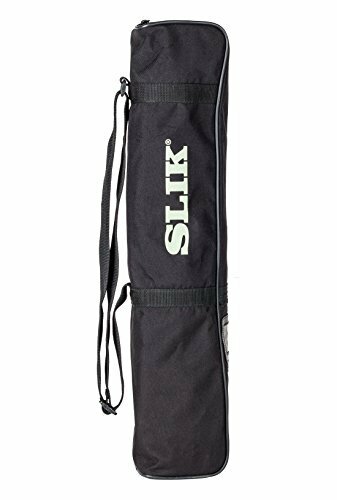 Slik basic Tripod bag, Medium, for tripods up to 23 inches when fully retracted. The Slik TBM Medium Tripod Bag is a weather resistant vinyl bag made to carry a Slik tripod up to 24" long. The bag has an ID window and a zippered pocket on the side. It is carried by an attached shoulder strap. 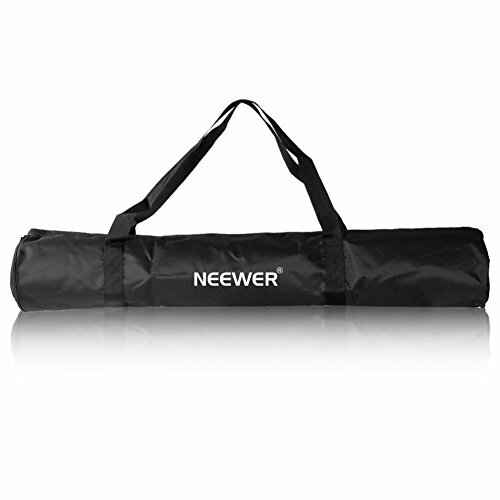 This Carrying Bag is the ideal case for your traveling lighting studio. This zippered bag is great for transporting light stands, umbrellas, and other accessories. This zipper bag is made of a durable material, is light weight, and very convenient to carry. This bag makes it possible to pack up your studio anytime anywhere. If you are not satisfied for any reason, you have a half year to return the item, no questions asked. Made of strong and durable nylon material,heavy-duty and shockproof. This bag makes it possible to pack up your light stand and tripods anytime, anywhere. 2 WAYS TO CARRY: Comes with a padded handle & 2 adjustable shoulder straps ,which makes carrying your tripod much more comfortable. Better Protection with Padding: The foam padded walls help protect your equipment from becoming damage. 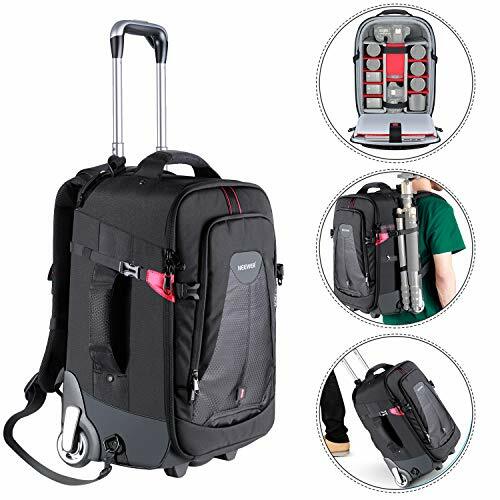 A perfect and useful travel companion, this convertible rolling camera backpack makes it easy to store and transport all your camera tools, never worry about forgetting or losing some pieces. 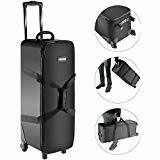 It also makes you feel convenient while travelling, large size accommodates lots of photography equipment and rollerblade-quality wheels ensure effortless mobility. This backpack is designed with the adjustable padded shoulder straps to give you a most comfortable feeling for your shoulder when you carry it on. You can also hide the shoulder straps clip in a back pocket when you don't need to use them. The telescoping handle extends for rolling the camera backpack from one place to another in a very convenient way. It collapses down smoothly for compact storage when not in use. The backpack also comes with a rugged top handle, which offers a secure grip for lifting or carrying in short distances. The rain cover can help you to protect the bag and your valuable equipment from rain, dust, dirt. Note: Roller Bag ONLY. Stand, LED Light, Flash and other accessories are NOT included. 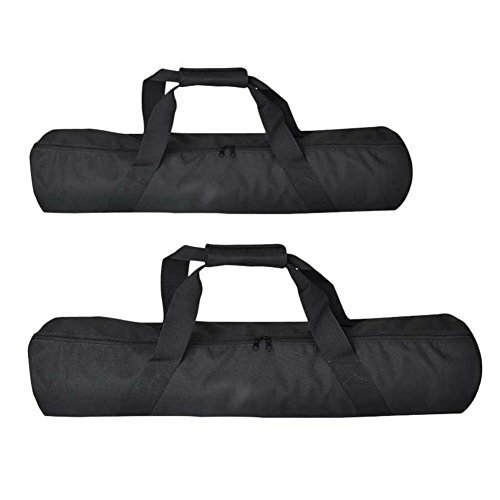 The durable lighting kit bag can effectively hold multiple equipment. 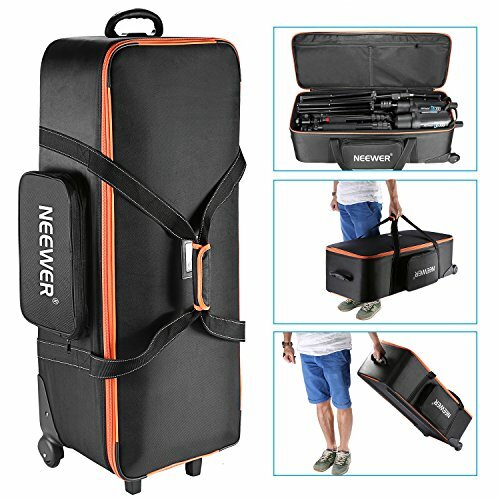 It is ideal for carrying and storing camera, light stand, umbrella, monolight, LED light, flash, speedlite, cables and other lighting equipment. The bag is made of durable Cordura webbed nylon, which can carry heavy equipment strongly. The waterproof bag protects the equipment inside from rain and tears, great for on location productions or for safely storing your equipment when not in use. The bag can be transported by carry straps with an overlapping grip or with a retractable tote handle and built-in wheels. The shoulder strap makes it more convenient when you are out and on your way. Inside the bag comes with three moveable padded dividers that can be secured in place to organize your gear. Roll the bag to your destination on the easy glide rubber wheels, which reduce bumps for smooth mobility and light travel. Roll the bag with the top handle, or carry it using the side soft handles. Durable plastic corners and supports provide extra exterior protection for your gear inside. 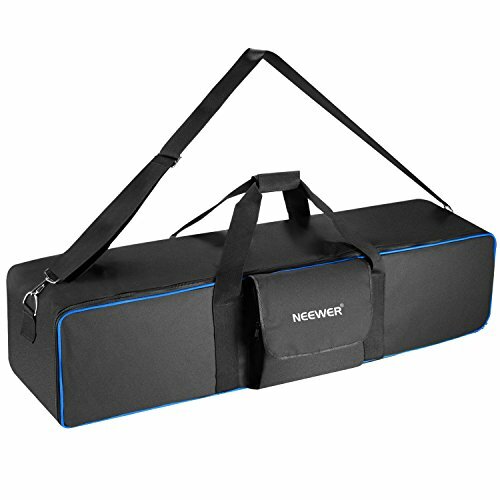 This bag is ideal for photographers and videographers looking for a compact yet capable travel roller bag designed to fit travel LED panels like the 650 and everything that comes along with them. Exterior Dimensions: 43" x 13" x 11"
Brand: Fovitec | Manufacturer: Fovitec (USA) International Inc. Introducing our newest additions to the tripod bag line! 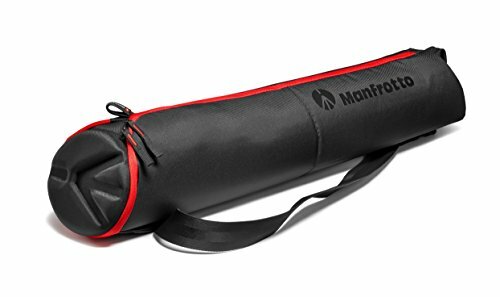 The tripod bag range is now complete after adding 2 smaller sizes, Specifically designed to hold the latest Manfrotto tripods: 190go! and the new 290 family. Asymmetric Shape: The tripod legs fit comfortably in the narrower end and extra space is allowed for the larger volume of the head at the wider end of the bag. Ease of Use: Getting the tripod in and out of these bags is fast and easy thanks to the zipper that extends down to the full length of the bag, even where the head is stored. Comfortable Strap: They feature also a strap for a comfortable shoulder carrying. Quality: All these bags have been made with the highest quality materials: ballistic nylon that prevents the bag from abrasions and tearing, and an external coating that makes it protective and water-repellent. Specifically designed to hold the latest Manfrotto tripods: 190go! and the new 290 family. With the case, make it easier to take around on trips for all your video shooting needs. Provide more room for placing your phone or other accessory in it. 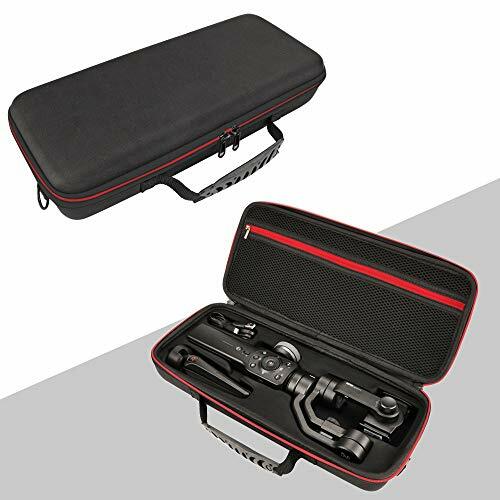 Free to Carry Outside Perfect Carry Case Design for your Zhiyun Smooth 4, makes it easier to take around on trips for all your video shooting needs. Provide More Room There is more room for extra things like phone, other accessories, a small tabletop tripod, etc. Enough room provided for you to transport and store your equipment. Flashes, strobe lights, tripods and monopods are all able to be stored in it. Side pocket is a good place for you to assemble some cables, batteries and other gadgets. 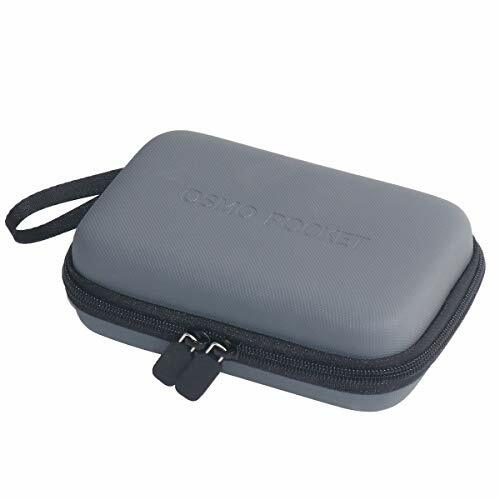 With the solid structure, this case can protect your delicate photography equipment from dust, water, scratches and damage. With three removable padded dividers inside the bag, you can store different kinds of equipments and little items separately with your various needs. The bag has smooth wheels at the bottom and a handle on the top of the bag which can help you carry more conveniently. It also has carry straps with an overlapping grip for you to easily lift up when you face the stairs. USA GEAR S1 Tripod Case. Quick & Easy Access - The S1 tripod bag is a sleek and compact black case designed to perfectly compliment any photographer's tripod and accessories set up. The innovative all around zipper allows for fast access to your tripod , so you aren't wasting any time. You can also fully unzip and open the bag for easy packing and unpacking of your tripod and photo accessories. The case's two easy-pull zippers eliminate snags and knots , so you can always get to your tripod when you need it most. Expanding Fit - Perfect for on the go photographers , this case is designed to be your one stop shop for your variety of professional tripods. Equipped with a zippered expanding side , custimze the size of your bag to fit folding tripods from 21 to 35 inches long! You no longer need multiple cases for your tripods. 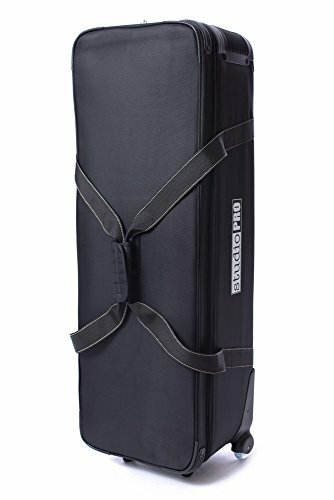 Protect Your Investment - This high-quality tripod bag offers protection against dust , dirt , moisture , and the bumps and knocks encountered when moving your gear. 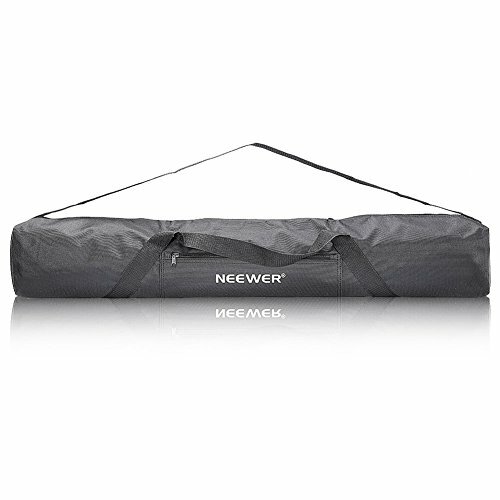 Both the base and top of the tripod bag are reinforced with a durable , padded neoprene material. The case's cylindrical design and construction ensure an excellent fit with most popular tripod models. Multiple Carrying Options - Fully adjust the non-slip shoulder strap to customize your fit , or use the convenient hand straps. Find the carrying style that is best for you! An additional zippered accessory pocket on the side of the bag is great for your chargers , memory cards , and other photo items. Exterior Dimensions: 26 x8 x 6.5 inches - Extended: 37 x 8 x 6.5 inches - Tripod Fit: 21 - 35 inch when collapsed. Compatible with:. Dolica , Vista , Ravelli , Manfrotto , Sony , PLR , Polaroid , Sunpak , Opteka , SLIK , Targus , Vanguard. ...and many other devices! PROTECTIVE CASE protects your tripod & works perfect for holding Dolica , Vista , Ravelli , Manfrotto , Sony , PLR , Polaroid , Sunpak , Opteka , SLIK , Targus , Vanguard & more! It is necessarily important for photographers to have a carrying case for their photography facilities. 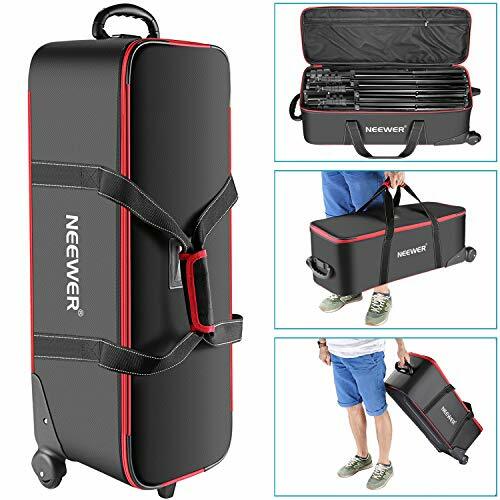 This large sized carrying case is big enough to carry light heads, light stands, tripods, boom arms and other photographic equipment and accessories. Ensure your tripod or studio kit when not in use is properly protected from dirt, moisture, dust and damage. Plastic buckles can strengthen the safety of the case. 2 padded inner compartments; 1 padded level compartment. The extra side pocket can be used for cables, batteries and other gadgets. A handle for secure transportation in your hand. It has carry straps with an overlapping grip for you to easily lift up. little items separately with your various needs. This bag makes it possible to pack up your studio equipments anytime, anywhere. 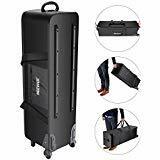 Easy to transport light stand,tripods,backdrops,reflectors,umbrella,softbox,flash strobe lighting kit and other accessories. Foldable and has padded compartments,which keep all your gears safe while taking your photography or video studio on the go. Lightweight and foldable, have one padded compartments inside. The durable Lighting kit bag is ideal for Photography or Video. NOTE: Bag ONLY, other items are NOT included. 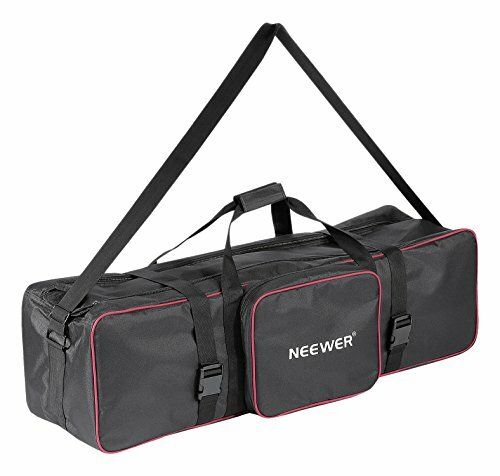 Description: This Roller Bag is designed to carry light heads, light stands, cables and accessories. There are two wheels at the bottom of the bag, you can move the bag easily and comfortably. With solid structure, the bag is strong for carrying equipment and protect your equipment from scratches and damage. With the rubber feet at the bottom of the bag can help keep balance when it needs to stand on the ground. you can store different kinds of equipment and little items separately fulfilling your various requirements. The bag can be transported by carrying straps or a retractable tote handle or built-in wheels. 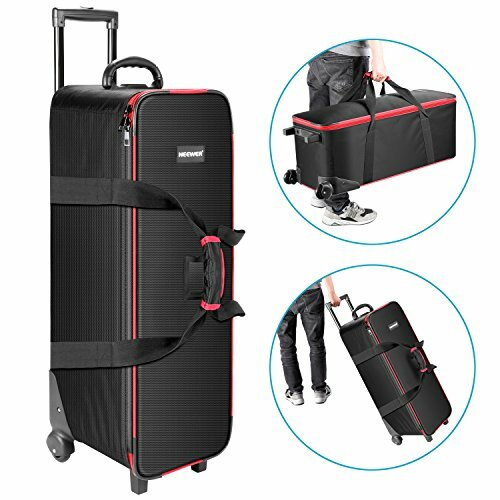 Specifications: Material: Nylon Color: Black External Dimension: 40.1x 11.8 x 11.8inches/102x 30x 30centimeters Inner Diameter: 38.9x 10.6 x 10.6inches/99x 27x 27centimeters Package Contents: 1x Rolling Bag "
NOTE: Light Stand and Tripod are not included. 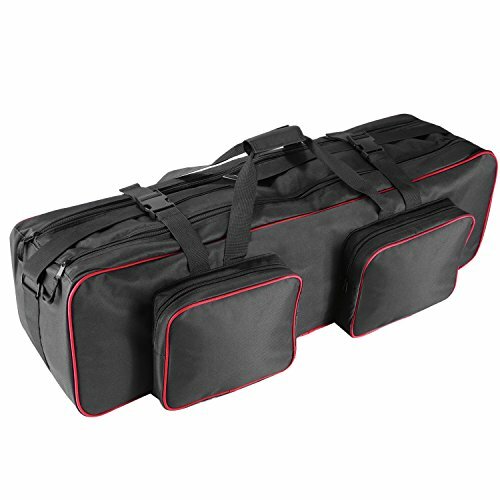 This carrying case is big enough to carry light stands, tripods, boom arms and other photographic equipment and accessories. It helps to protect your light stand, tripod from dirt, moisture, dust and damage. The zippered exterior pocket can be used for cables, batteries and other gadgets. You can carry with the shoulder strap; Double handles ensure secure transportation in your hand. Weather resistant vinyl case made to carry a tripod up to 36 long. 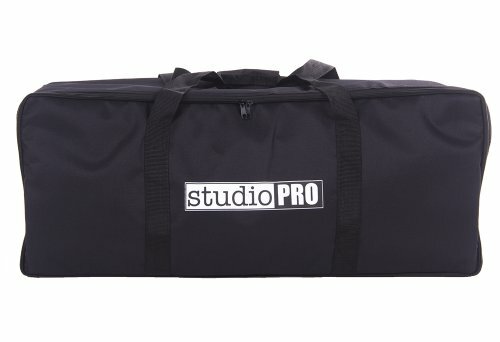 The StudioPRO Large Size Bag for Complete Kit is a large 30"x12"10" duffle style bag that is great for transporting any combination of lights and accessories. It is padded on all sides to protect your light stands, bulbs, lights, and other gear. It is large enough to fit a complete kit while still being convenient enough to carry your photography or video studio on the go. This is a premium travel companion. 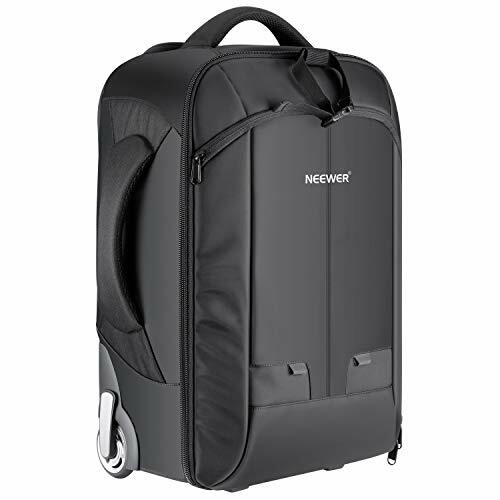 Convertible Rolling Camera Backpack can stores and transports most your camera gear with exceptional ease and convenience. 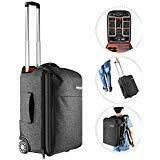 Large size accommodates loads of photography equipment and rollerblade-quality wheels ensure effortless mobility, whether it's through airport terminals, across uneven terrain to remote photo shoots. Adjustable padded shoulder straps to ensure a secure fit and maximum comfort. Bottom anti-slip design and included rain cover provide extra protection. Capacity: DSLR camera with standard lens attached, 15 inches laptop/tablet, 2-4 extra lenses, a flash unit and small accessories such as memory cards, cables, batteries; Side straps offer a handy place for holding tripod or monopod. With a rugged top handle, which offers a secure grip for lifting or carrying the bag short distances. 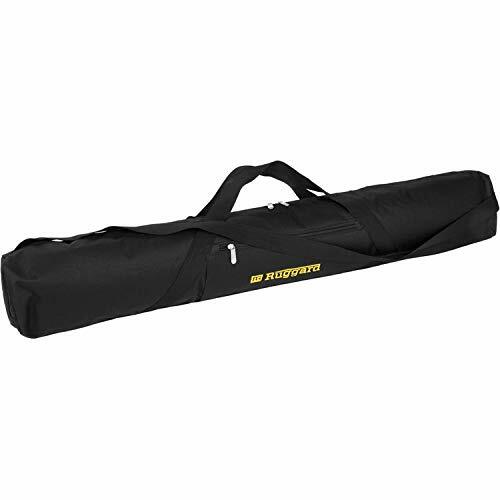 the black with yellow embroidery, 42" Padded Tripod or Light Stand Case from Ruggard is an affordable, lightweight, and functional way to store or carry your tripod, light stand, and umbrellas. The durable 400D nylon exterior is complemented by a smooth 150D nylon lining. Dual top zippers provide full-length rapid access to your tripod. This case can be transported by its two top carry handles, or by its very useful fixed-length shoulder sling. For added storage, there is an exterior 13.5" zippered pocket. The case is accented with a large, handsome yellow embroidered Ruggard logo. 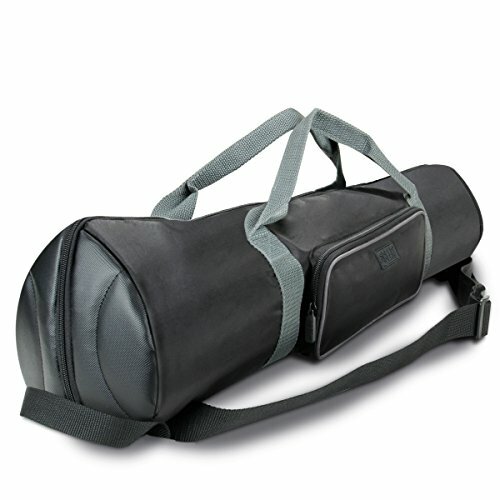 This 42" Padded Case is backed by a one-year limited warranty from Ruggard. Storage available for the handheld camera, Controller wheel, Data Cables, SD card, cable adapters, cellphone, and a few accessories. made from waterproof PU leather and EVA foam. Durable, easy to carry. 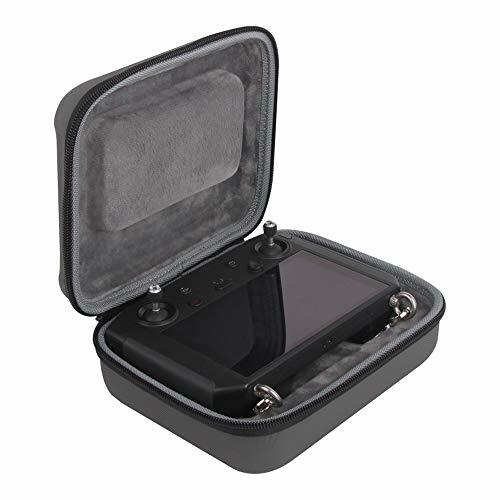 Portable carrying case design for DJI with Screen Smart Controller Mavic 2 Pro/Zoom drone accessory. 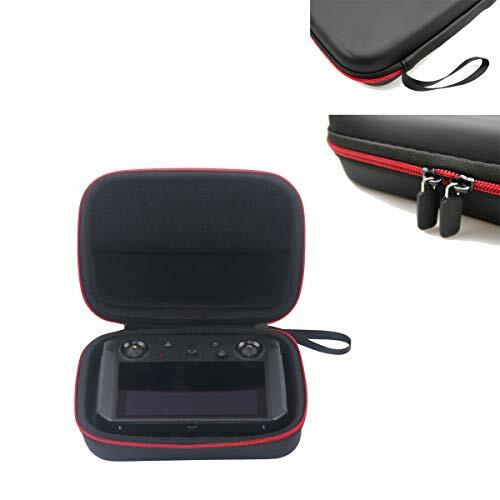 High-grade waterproof PU leather hard shell exterior + plush fabric inner,shockproof, dustproof to protect your smart controller from scratch and bumps. Compact and portable, soft and comfortable handle, easy to carry,hand held or can easily into the shoulder bag. Compatible with DJI Mavic 2 Pro / Zoom drone's Smart Controller. [High-quality] Made of high-class waterproof PU leather hard shell and flannel lining interior. [Precision Fit] The Smart Controller can be stored together with lanyard, No need to remove the rocker. The internal raised block design effectively protects the remote controller screen. [Portable] Product dimesions: 8.2 x 6.7 x 3.1 in. weight: 0.57 lb, can be easily stored in a backpack. 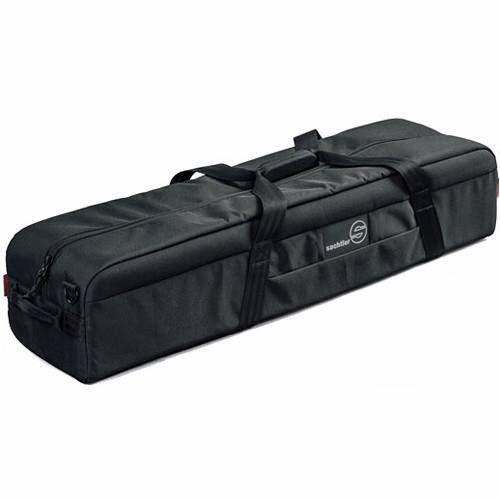 This Padded Bag is designed for flowtech 75 or TT Tripod equipped with FSB Fluid Head. It provides added transportability and safety to the flowtech 75. It ia made with high density 900D fabric, which is water-resistant as well as flame retartdant to ensure your equipment is safe.